We have civets, pangolins and wild boars running wild in Singapore?! We have wildlife here? In line with their current curriculum on the students’ interests to explore the rainforest theme, my daughter’s kindergarten, Two by Two Schoolhouse invited non-profit organisation, Animal Concerns Research & Education Society (ACRES) to the school to talk to them about animal consciousness and kind treatment towards the animals. To add cohesion to their learning, the preschool was kind enough to involve the parents and invite us as guests for the talk. Pip, a young pangolin, miraculously survived crossing a busy main road, only to find herself lost and confused in a basement car park. Pip was very stressed when we got to her and also dehydrated. After being rehydrated and then acing a health check from the vet, Pip was microchipped and released back to the wild, scampering away after her lucky escape! Little Ola the fledgling owl was separated from her mother and somehow became stuck inside a thorny bush. When we arrived to help her she was weak, lost and screeching loudly. But thankfully Ola recovered quickly after being untangled from the bush, rehydrated and allowed to rest. Her rescue was complete when her mother was located and the two were reunited. The kids learnt that animals have feelings just like us; they live with their families and have emotions (happiness, sadness and fear), and just like us, they have rights on this planet we call Earth. They also learnt where they can see native wild animals (apart from the zoo) at Bukit Timah Nature Reserve (did you know it is a rainforest? 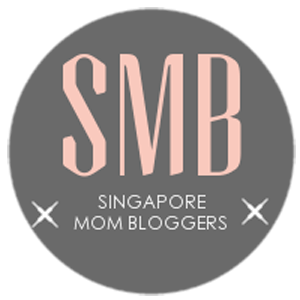 ), Pulau Ubin and Kusu Island. 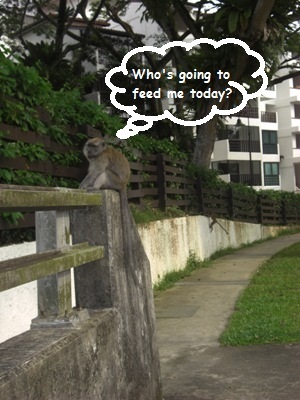 And if you, like me, have friends who live in far, far, ulu* areas like Dairy Farm or Linden Drive, you just might catch a glimpse of some hairy residents (reference monkey on you left) loitering on the streets. We were even visited by a special guest – Penny, a Pomeranian pet of animal activist Mr. Louis Ng. Penny was rescued from a puppy mill and suffers from a deformed hind leg. Through the kindness of her owner, she is now able to walk and run, albeit with a limp, does not like loud noises but is more comfortable with strangers now. My daughter having a one-on-one time with Penny. One for the album – teachers and students posing with Penny and ACRES staff. ACRES did not ask me to do this, but I thought I’ll add it in the post anyway. They need to raise SGD$100,000 this year to keep their wildlife rescue team on the road and to support the work of the ACRES Wildlife Rescue Centre (AWRC). Shop at the ACRES online store – buy a t-shirt, a mug, a book, a badge or a car decal (prices range from $2 – $10) with messages to cherish the wildlife. They also have handphone pouches ($38) or key pouches ($48) on sale. Be a volunteer – read about the experiences and benefits of being a volunteer at ACRES here. I’m signing off now. I have some shopping to do at the ACRES shop. *ulu is a Singlish term meaning very far and remote. i had no idea…very cool!